Blue Cat Audio have today released Late Replies version 1.1; bringing many graphical user interface enhancements such as full GUI zoom, new presets management features and major performance improvements. It also fixes a couple of issues on both Mac and Windows (see the full change list below). The GUI can now be zoomed from 70% to 200%. Input and output effects strips can now be locked. Last loaded preset is now remembered in session and displayed in the presets menu. Plug-in state can now be reverted to the last loaded preset. Default preset now also saves the state of locks (when using “save as user default”). Major presets loading improvements: hosted plug-ins are now reloaded only when changed, and updated otherwise. 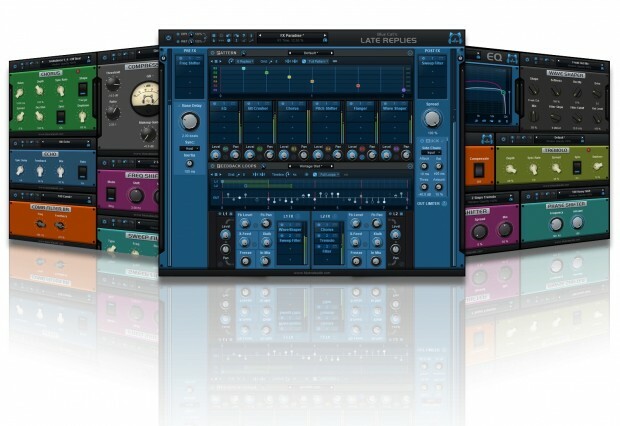 Improves performance and audio rendering when loading presets using the same plug-ins. Faster GUI loading / instantaneous GUI display after it has been opened once. Limiter on/off state is now independent from presets (“always locked”). New option to keep plug-ins windows always on top. Performance and memory usage improvements. Improved Pitch Shifter built-in plug-in (fixed aliasing artefacts and added new modes). VST3: factory presets are not exposed to the host application anymore. Fixed minor compatibility issues with Mac OS High Sierra. Fixed: changing bypass in the Audio Unit version did not update host application’s bypass state. Fixed: bypass buttons are now in sync with the hosted plug-ins’ state. Mac: fixed presets directory not properly created for built-in plug-ins, breaking the save preset feature. Win: fixed copy/paste that sometimes stopped working until next app restart. This entry was posted in DontCrack, Plug-ins and tagged Blue Cat, Blue Cat Audio, Delay, Late Replies, Update. Bookmark the permalink.